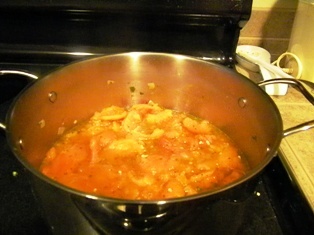 My original plan for making fresh tomato sauce was to use all home grown tomatoes. I have three plants in my backyard and they are all full of tomatoes. However I only had a few ripe ones. My plants are full of little green tomatoes. I have tons of them, but I’m afraid the weather will turn cold before the tomatoes are ready. Unfortunately we did not have warm enough weather until close to July, so I wasn’t able to plant until then. So I had to buy some tomatoes to make enough sauce. Making sauce from fresh tomatoes is an involved process, but well worth it. 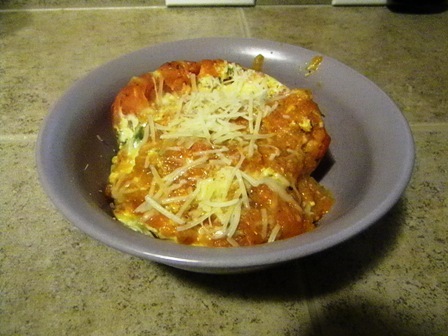 I made tomato-basil sauce last time, so I thought I would add some different flavors to this one. 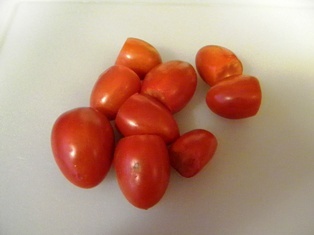 I had frozen some of my home-grown tomatoes in anticipation for getting more, so I will include that process as well. Part One: Preparing tomatoes to make sauce. Wash tomatoes and cut off the tops. Boil a large pat of water. 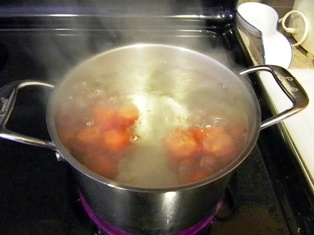 Add tomatoes to boiling water for 30 – 45 seconds. 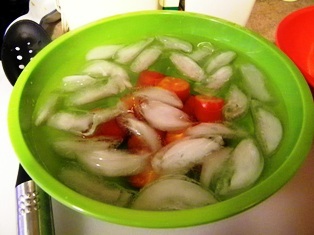 Remove tomatoes and place in ice water for another 30 – 60 seconds. Use your fingers to slide the skin off the tomatoes. Squeeze tomatoes over a strainer to get the seeds out. I had a little trouble getting all the seeds out, so I rinsed the tomatoes in cold water. 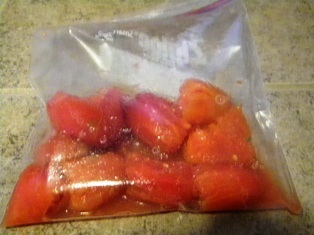 If you are freezing the tomatoes, place them in a freezer bag and pour the liquid you reserved in with them. In a large pot heat olive oil, garlic, and onion. Cook until onion is translucent and just starts to carmelize. Add tomato liquid. Add tomatoes. Stir in spices. Allow to simmer over low heat for two hours. If desired puree in blender briefly – this will give it a more traditional sauce texture. My homemade sauce never turn out bright red. It just depends on the tomatoes you are using.